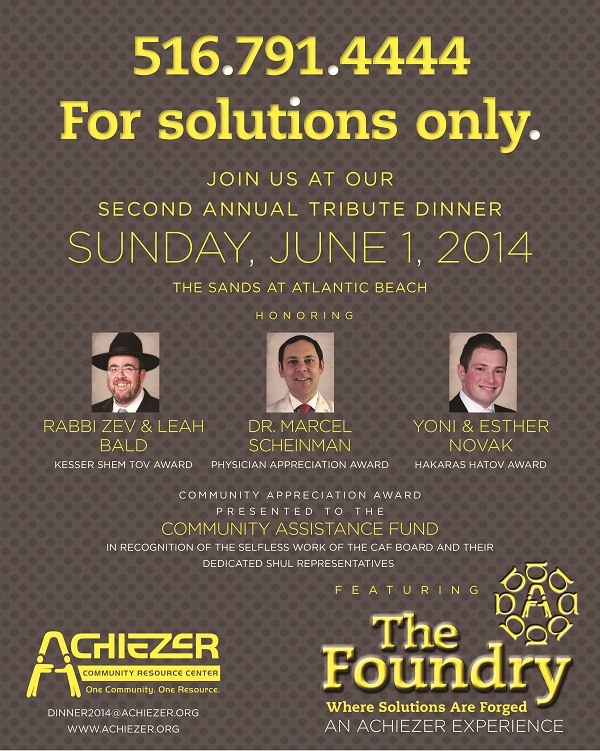 Achiezer's second annual tribute dinner will Be'ezras Hashem take place on June 1, 2014. All facets of our community will join together for one cause; one mission: CHESED. We are privileged to pay tribute to a number of deserving individuals who shy away from public recognition. Dr. Marcel Sheinman is a man who personifies gemilas chasadim. Since its inception, he has been at the forefront of Achiezer's mission. Dr. Sheinman is a true partner who consistently provides timely solutions during dire emergencies. Yoni and Esther Novak define selflessness and dedication to our community. Esther's work as Achiezer's chief intake coordinator has touched the lives of thousands in our community. Her compassion for each client, coupled with the dignity she affords them, makes her a valued member of the Achiezer team. Yoni is not merely her supportive spouse, but has personally been involved on numerous occasions by volunteering to assist others in need. Zev and Leah Bald are true friends of Achiezer. They are always ready to give of themselves, whether it's to lend a hand and pitch in during a project, or offer sage advice to a community member in need. There is not one organization or mossad in this community that does not have their numbers in their list of vital contacts. The word no, does not existin the Balds' lexicon. Our final tribute is paid to the members of the Community Assistance Fund (better known as "CAF"). This heroic group led a remarkable, dignified and unforgettable rebuilding campaign for the community. As Sandy memories begin to fade, we, as a united community, will never forget what these devoted and upstanding people have done for us. Let's face it. Achiezer's dedicated staff has never been busier. Advocating and working on behalf of the entire Five Towns, Far Rockaway, Bayswater and surrounding communities is their daily mission. Members of Achiezer's team provide real solutions to real problems, collaborating with each and every organization in our community. Achiezer does not solicit during the year. Achiezer's staff and over 300 volunteers are busy, seven days a week, 24 hours a day, helping our community. Please take one night to celebrate the success in Chesed that Achiezer embodies. Let's pay tribute to these inspirational individuals and learn more about Achiezer's mission at what promises to be a most enjoyable and inspirational evening.